Gold and silver rose yesterday but have experienced a pullback overnight (gold from $1,128.00/oz to $1,117.50/oz). Gold is currently trading at $1,118.00/oz and in euro and GBP terms, gold is trading at €768/oz and £688/oz respectively. Healthy premiums for gold show that there is robust physical demand in Vietnam and India at these price levels. The Indian central bank bought 200 metric tonnes (purchases occurred over two weeks prior to October 30th) when gold was trading between $1,030/oz and $1,070/oz and this could mean that gold will see sustained 'dip buying' above $1,100/oz. The increasing risk appetite seen yesterday (on the Dubai bailout) may be challenged in the coming days by increasing Eurozone debt concerns. The risk of the bankruptcy of Greece is a real one given the terrible state of their public finances. Some governments (such as Ireland) have taken proactive steps to rectify the sharp deterioration in the public finances but other governments have been slower to get their house in order and the risks of sovereign defaults are real. Not just from Greece but also from the Ukraine, Bulgaria, Hungary and Latvia and other Baltic states (these countries carry foreign debt that exceeds 100 percent of their GDPs). 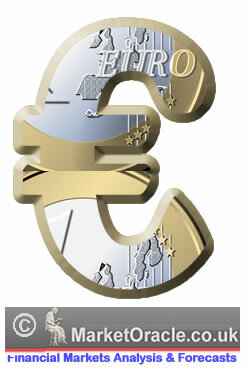 The means that gold will likely move up in value in euro terms in the coming months. It is worth noting that in the 1970s bull market gold surged in value in dollars, sterling and in Deutsche marks - one of the strongest currencies in the world in the 1970s. Gold traded at less than DM80/oz in 1971 and rose to over DM600/oz in 1980 and thus rose more than 7 times. Were gold to replicate such a performance which is quite possible it would rise from less than €300/oz in 2000 to over €2,100/oz in the coming years. The record nominal high in 1980 if adjusted for inflation would be the equivalent of some €2,000/oz. Silver dipped to from $17.42/oz to $17.18/oz overnight but it has moved upward slightly since. Silver is currently trading at $17.22/oz, €11.82/oz and £10.58/oz. Platinum is trading at $1,446/oz and palladium is currently trading at $366/oz. While rhodium is at $2,175/oz.